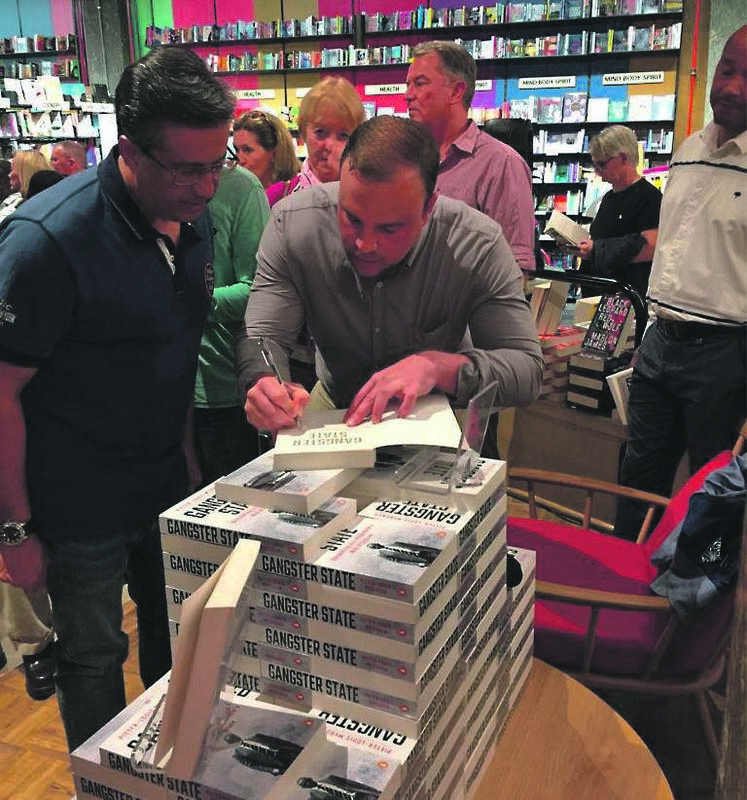 It was a full house for the launch of Gangster State by Pieter-Louis Myburgh at Exclusive Books in Sandton City on Tuesday night. But when City Press editor-in-chief Mondli Makhanya started introducing the event, it became clear not everyone had come for the conversation. The first signs of a disturbance came from the loud talking at the buffet which rose to a crescendo as protesters moved into the room. Chanting “tell us what Ace has done”, protesters grabbed copies of the book, tearing the pages and scattering them on the floor before throwing destroyed books at the onlookers. They ironically chanted “we don’t like hooligans” as they disrupted the event and shouted “Ace, Ace, Ace ...” – it was clear they had come in support of ANC secretary-general Ace Magashule. Their bully-boy tactics went a long way to convincing everyone in the room, and those following on social media, that the book’s contents were hitting someone’s nerves. The protesters seemed to have done their protesting on a full stomach, as the buffet table was cleared to the last crumb of its biscuits, Brie and sauvignon blanc. Fortunately, the empty wine glasses and bottles did not join the books as projectiles. While the protest continued, those who had turned up to hear the author speak bought copies of the book and the author calmly signed them, with copies of torn books fast becoming prized possessions. While the security guards came fairly quickly, they formed a barrier to contain the protesters, waiting for the police who, arrived about at least 30 minutes later. It was clear the scheduled interview would not take place as the police reached the scene, asking the guests to leave – which I did, clutching my copy of Gangster State (after all, a book that makes the powerful this desperate must be full of juicy stuff). Half an hour later the protesters exited the bookstore, chanting as they did a lap of the shopping centre and then left. The concept of a Gangster State had leapt from the pages into real life. As guests huddled closer together between the aisles of the children’s book section to listen to Lerato Mogoatlhe speak about her amazing travels throughout Africa, the atmosphere at Exclusive Books Rosebank on Tuesday night was electric, albeit calm considering a few km’s away there was a rousing reception (of sorts) to Pieter Louis-Myburgh’s launch of Gangster State at Exclusive Books Sandton City. 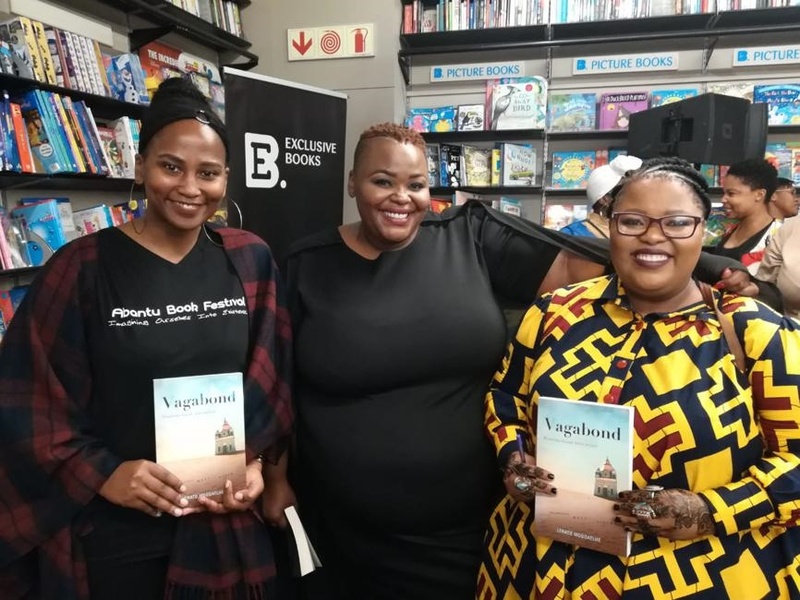 Around 150 people turned up for the launch of Mogoatlhe’s travel memoir, Vagabond, and no sooner did the crowd start asking questions did she say that she was amenable to taking more questions, despite the clock ticking over for the evening. The launch also coincided with the 35th birthday of Blackbird Books founder, Thabiso Mahlape, who looked radiant. Mogoatlhe, who was in conversation with Power FM’s Power Lunch host Aphelele Somi, has done what not many have done before - she travelled solo to 21 African countries over a period of five years, and an evening’s worth of conversation was not nearly enough to cover the many adventure’s she encountered during her travels. Her point was clear: Africa has a lot to offer, and we shouldn’t be scared to engage our fellow African brother’s and sister’s in their cultures and foods through our own travels across the continent. “People always think that spicy food is Indian food, but Ethiopia has rich spicy cuisine. People always think that Mali is poor. But it has immense cultural heritage and some of the oldest universities on the continent,” she explained. She had spent six months in Mali, her highlight of her travels, she said. Adorned with henna on her hands, no doubt a love that she picked up from the west African countries which she visited, Mogoatlhe glowed as she shared her experiences. As guests sipped into their glasses of red and white wine, she explained how she had to readjust her way of thinking, after meeting a group of men one night who had invited her over to their house. “I stopped and told them that I was uncomfortable and realised that I needed to go back to the bar. They told me: ‘Shame sisi are you scared? We know in South Africa this could end badly but we will go back to the bar.’ I realised that travelling outside of South Africa was way easier than I thought it would be, and that I could be freer in what I did, obviously with caution,” she said. During her travels, the sounds of Lucky Dube and Brenda Fassie would echo across the continent, something which Mogoatlhe used to her advantage to form bonds with strangers who would want to know more about how she knew the lyrics. It was through music that she formed many connections. “Home is everywhere on the continent,” she explained, as she urged everyone to get out of the mindset that home should be one single place for a prolonged period of time.